Toen zij klaar was met haar werk, lag er een compleet businessplan. Financiële Studievereniging Risk geeft inzicht in wat IVWear doet, hoe Mireille daaraan heeft bijgedragen en welke belangrijke rol Fit Professionals hierin speelde. Met dank aan Tobias Maier en Jeroen Huijgens lees je hieronder hoe Fit Professionals samenwerkt met studenten om startups naar succes te begeleiden. Zij spraken met Mireille Koster en Melcher Frankema, oprichter van IVWear. Fit Professionals finance intern Mireille Koster joined IVWear for a while. When her job was done, the start-up company from Groningen had a complete business plan. Risk Magazine explains the work of IVWear, how Mireille contributed to this and the essential role played by Fit Professionals. Tobias Maier and Jeroen Huijgens wrote an article about how Fit Professionals works with students to coach start-up companies on their path to success. They interviewed Mireille Koster and Melcher Frankema, Founder of IVWear. Fit Professionals of Finance recently launched a new business line, specifically intended for start-up companies. As their finance sparring partner, Fit Professionals helps them develop their ideas and products into financial models, work out business cases, or even get their first investments. Such finance expertise is offered through a platform called VentureLab North. Fit Professionals delivers this financial expertise by employing finance students in the final year of their Bachelor’s or Master’s programme who have the ambition to work as an interim finance professional and to be the CFO of a start-up company. 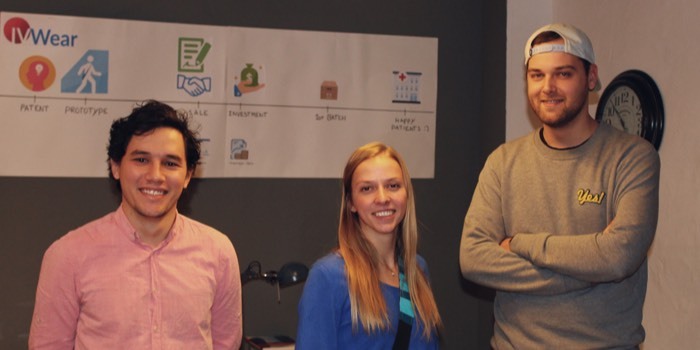 IVWear is a Groningen-based start-up, founded by three students. The company is working on a solution to overcome the stigma of the IV pole, an object that stands for sickness and dependence. This situation called for radical improvement. The founders also noticed that the IV pole kept people from getting any exercise. And as exercise speeds up the recovery process, the company’s aim is to mobilise patients. IVWear developed a wearable IV, the Ivy One, that frees patients from the IV pole. Besides improving the prototype, the founders were working on their business plan. Experts in the medical field and product engineering, they knew little of finance. This is why they approached Fit Professionals of Finance. Fit Professionals selected Mireille to assist IVWear. The matchmaking process is straightforward, but requires knowledge and expertise. First, the job requirements are thoroughly discussed. Fit Professionals then pre-selects a suitable candidate and introduces him or her to the start-up client. Mireille enjoys working at a start-up company in the healthcare sector. The responsibility for finance adds much value to her study programme. Her work at IVWear allows her to apply theoretical knowledge and gain practical experience. She has the support and advice of Fit Professionals at her fingertips whenever she needs it. Mireille is in charge of IVWear´s finances and business plan. “Our investors require the figures to be spot on,” Melcher explains. He also states that Mireille adds value to the company as she builds the financial framework. Mireille values the opportunity to be part of IVWear in this crucial development phase. Especially because her job is long-term oriented rather than purely administrative. Moreover, as a Master student, Mireille likes the flexible nature of this job. She works at IVWear once a week and combines her work with her studies. Fit Professionals, IVWear and Mireille all benefit from this unique consulting project. Fit Professionals intends to expand its network of interim financial student consultants in the northern Netherlands. Stay tuned to their website and LinkedIn for job opportunities. IVWear is looking for additional working students to achieve their goal to mobilise patients. Sound good? Then kick off your start-up experience now! Fit Professionals of Finance is a financial consultancy and deployment agency in Groningen. Its goal is to be the leading agency in the northern Netherlands. Fit Professionals wants to achieve and maintain this position by knowing its finance professionals and clients well, and understanding their specific challenges. Fit Professionals lives and breathes three core values: Expert, Committed and Fit. These deeply rooted values are promoted by contributing to the growth and development of the region, by encouraging the entrepreneurial spirit and by coaching financial experts in their career as interim professionals.